Our lodging solutions put mobile access and RFID ease of use and security in the palm of your hand. 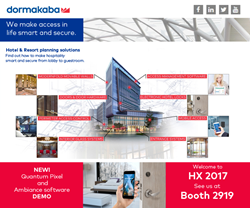 dormakaba, one of the top three companies in the global market for access and security solutions, will arrive at the HX hospitality expo at the Jacob Javits Convention Center in New York with a total-property access solution that includes mobile access electronic door locks and new software for hotels. dormakaba manufactures the Saflok™ and Ilco™ electronic door locks and provides installation and service for its systems. At HX booth #2919 the company will demo the new Quantum® Pixel line of electronic and mobile access guestroom door locks and its Ambiance software platform for smart and secure lock management. dormakaba will also present its line of Modernfold industry leading Acousti-Seal® moveable walls, and acoustically rated Acousti-Clear® glass wall systems. Click here for a 3-minute video that shows how dormakaba simplifies the lodging experience with its ‘Smart Design’ line of products for the hospitality market. “dormakaba’s Smart Access solution suite simplifies the lodging experience beginning at the hotel entrance with multiple lobby access systems and extends to guestroom access,” said Stephen Pollack, dormakaba vice president marketing. “Our lodging solutions put mobile access and RFID ease of use and security in the palm of your hand.” All of dormakaba’s electronic lock systems shipped today are mobile access compatible. Systems are iOS and Android ready and easily adapt to third-party integrator platforms. Thousands of properties trust dormakaba to secure property data and provide a quality guest experience. dormakaba’s mobile access solution is a secure, open platform that adapts to hoteliers’ business goals and marketing needs while enhancing the guest experience. Every dormakaba RFID lock manufactured today is compatible with iOS and Android smart devices for wider adoption. Click here for more information on electronic door locks from dormakaba. Attending HX 2017? Visit dormakaba’s professional team in Booth #2919.